Ahhhh Sunday night. You always roll around faster than I’d like you to. It’s still disgustingly hot in Melbourne at the moment, and both the cat and I are finding ourselves disinclined to do anything except loll about feeling uncomfortable and drowsy. I was determined not to spend another weekend lying around with a book in one hand and a glass of water in the other groggily drifting in and out of sleep, so today I managed a trip to the markets followed by an afternoon of jam-making to use up the embarrassingly cheap strawberries I’d bought en masse. Admittedly the whole AM period (and into PM too, if I’m being honest) was spent groggily drifting in and out of sleep with a book in my hand, etc etc, but I had a reasonable excuse. 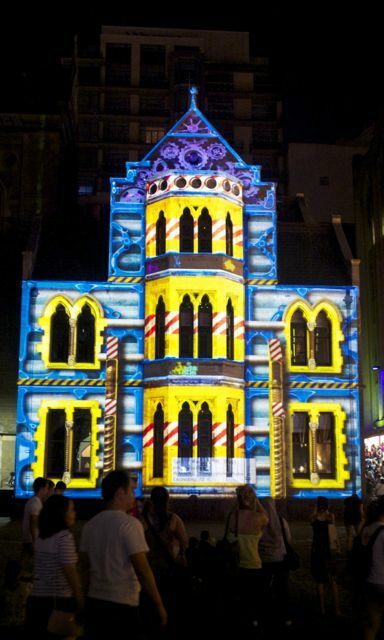 From 7PM Saturday to 7AM Sunday Melbourne hosted their first “White Night” festival, where 300,000 sweaty bodies packed into the city’s laneways to soak up the art and the atmosphere. The streets around my old apartment were so crammed full of people packed cheek-to-jowl that my date and I didn’t even attempt to venture that way – there was plenty to see elsewhere in the city. My favourite element of the night would either have to be the eerily beautiful music played under the great dome at the State Library, or the astonishing light displays down Flinders Street, where familiar buildings were given a fantastical new facade that moved and changed, crawling with snakes or 8-bit gameplay imagery. 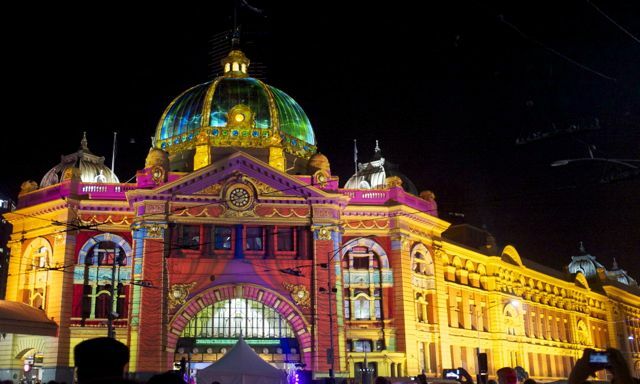 Flinders Street Station looked particularly astonishing. Anyway, it was a good night, and I’m glad I got the opportunity to experience it. The outfit I was wearing was pretty much the slightly less girly version of my Yen For It ensemble, since trekking around the city til all-hours it seemed like a trousery event. You don’t see me in pants very often, but I’ve taken a real shine to cropped trousers and ballet flats. It’s one of those imaginary no-no’s (short girls and ankle-length pants, that is) but what are fashion-rules there for if not to be broken, right? 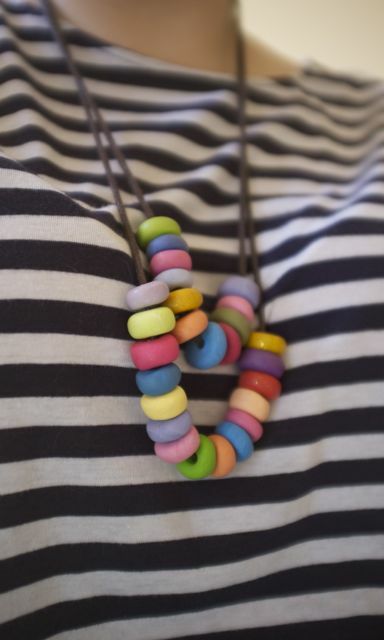 I’m also wearing my DIY’d fimo bead necklace, which goes with this outfit perfectly. 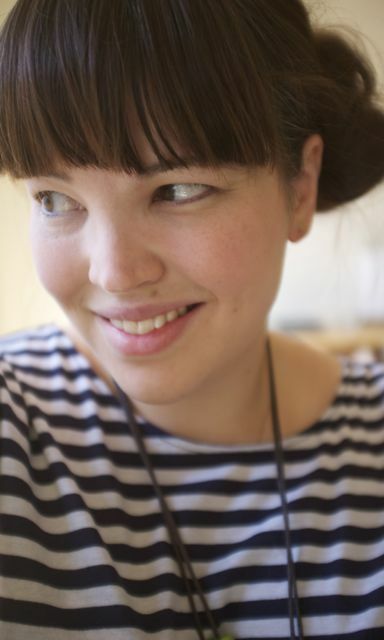 I’m also feeling very smug about having finally figured out how to master the side bun, which is definitely my favourite hair-do of the moment. It’s kind of reminiscent of my wedding “do”, but less elaborate, and without the addition of Blanche’s beautiful clip. Prior to now I’ve never been able to master the side bun, because I always ended up with a hard little knot of hair that just looked uncomfortable. After watching Lady Melbourne’s Ballerina Bun Tutorial I rushed out and bought myself a hair donut, and started experimenting, and finally I had the loose, casual side bun down pat. See? Look how happy I am with myself for it! 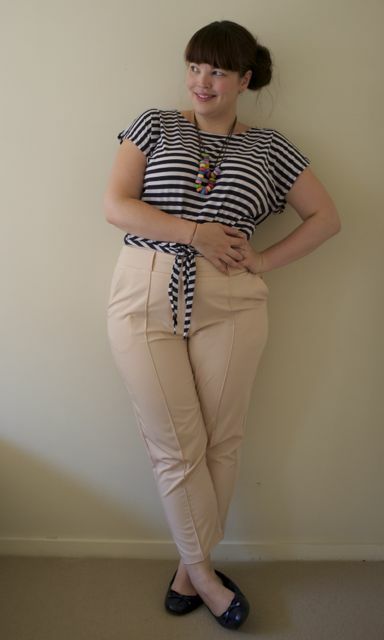 This entry was posted in Uncategorized and tagged asos, DIY, hot, Myer, trousers by lillipilli. Bookmark the permalink. Good heavens. Is that your tummy I see in one of those shots? A crop top! The hair pic is gorgeous. Just gorgeous. You are insanely adorable! Love this look on you. So chic! I have never EVER considered trousers like this until now! You look beautiful on the last photo. The weather is such a struggle in Melbourne at the moment! love the stripes and the fringe, just beautiful! 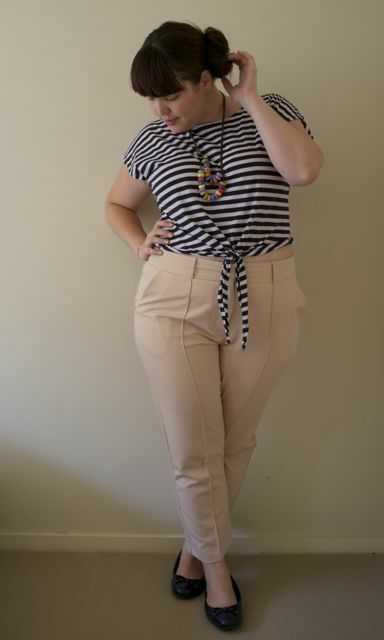 Not a huge fan of light pants but this is a darling outfit- so super cute and comfy! 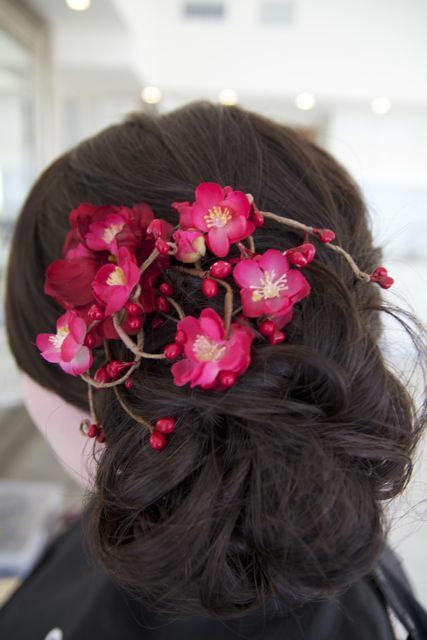 I think I am going to have to invest in a hair donut- though my hair is only shoulder length at the moment so not sure if its long enough! I didn’t check out white night as was a bit confused a out that exactly it was!! 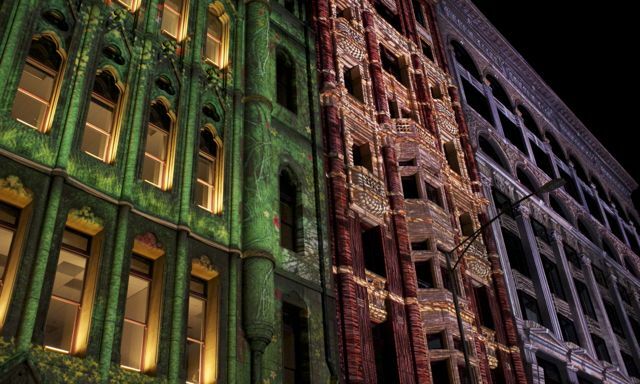 Now I wish I had- the lights on the buildings look gorgeous and yay for flinders st station looking spectacular- it is such a beautiful under rated building! Absolutely beautiful photos – does your flat have air conditioning? How do Aussies deal with the heat, or are you just accustomed to the weather? These photos make me wish that I still lived in Melbourne. It is absolutely one of my favourite cities. There is always something interesting going on in the city! Love that you’re breaking multiple rules (tummy showing, light pants, etc) with this outfit and looking AMAZING! I’m totally bummed I missed White Night, I didn’t even hear about it till after the fact! The pants and the hair look fabulous! I would have loved to see this outfit in profile, but you look great as always! LOL the heat makes me do it, too – at 5’2″ and a UK 18/20, cropped pants and ballerinas should be a no-no… but what else can you do but make the best of it, maybe add a Hermes scarf as a belt?! 😉 You are an inspiration to those of us with a little more to contend with and I feel so enabled! I love that tie front striped top. So Cute! Not a fan of these pants. But you look wonderfully fresh and stylish, as always! Cropped trousers and ballet flats, very Audrey a la Roman Holiday. I really love your outfit, so elegant! This outfit is so so perfect. Like Jackie Kennedy on a yacht!